Rounding out 2017 with its 18th flight, SpaceX launched a Falcon 9 rocket with 10 more Iridium NEXT satellites. Liftoff took place at 5:27 p.m. PST (8:27 p.m. EST / 01:27 GMT) from Space Launch Complex 4 E (East) at Vandenberg Air Force Base in California. This was the fourth of eight flights for Iridium Communications. The rocket placed satellites 31–40 into low-Earth orbit to join the upgraded Iridium NEXT constellation. Previously, SpaceX sent Iridium NEXT satellites into space in January, June, and October 2017. The next flight is expected sometime in February 2018. When all is said and done, it is hoped that 75 next-generation satellites will be placed in space to completely overhaul Iridium Communications’ satellite constellation. Each of these satellites weighs in at about 1,896 pounds (860 kilograms). They sport two solar arrays producing two kilowatts of power. The vehicles’ antennas support L- and Ka-band frequencies. 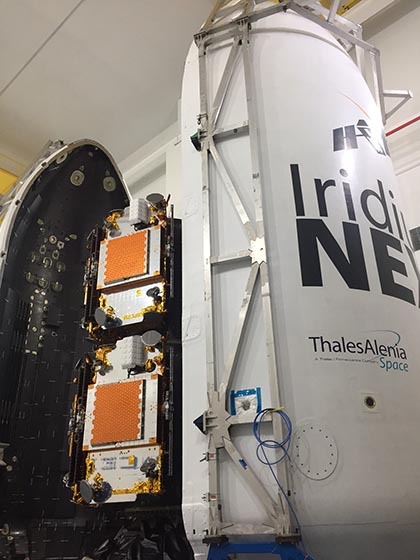 The Thales Alenia Space-built spacecraft are expected to have an on-orbit lifespan of about 15 years and operate at an orbit of about 480 miles (772 kilometers) in one of six orbital planes spaced 30 degrees apart. As noted on SpaceFlight Now, over the coming months, these 10 satellites will be integrated into the Iridium satellite constellation and ultimately replace 10 legacy satellites. Some of the first-generation spacecraft have been in space since the late 1990s. Once all 66 primary satellites, as well as the on-orbit spares, are switched out, the old vehicles will be placed in higher or lower orbits before ultimately being deorbited. For the Iridium-4 flight, the Falcon 9 flew in the expendable mode and no recovery attempt was made. However, the booster’s first stage, core 1036, was previously flown hardware. It was used during the Iridium-2 mission in late June 2017. This was the first time an Iridium payload flew on a used booster and the fifth overall since the first reuse by SpaceX in March 2017. The countdown proceeded smoothly. A few seconds before the planned liftoff, the nine first stage Merlin 1D engines ignited and powered up to full power. Once the onboard computer confirmed all of the engines were healthy, the launch latches were commanded to be released, letting loose the full might of the Falcon 9. Together, the first stage produces some 1.7 million pounds-force (7,600 kilonewtons) of sea-level thrust at liftoff. In just five seconds, the rocket cleared the transporter erector before beginning its pitch-over south toward its designated orbit. About 1 minute, 14 seconds into the flight, the vehicle reached maximum dynamic pressure (max Q), which is the point where the stresses on the vehicle are at its maximum. Two minutes, 33 seconds after liftoff, the first stage consumed its liquid oxygen and rocket-grade kerosene fuel and separated from the second stage, as planned. Falcon 9’s second stage is powered by a lone Merlin 1D Vacuum engine. It produces about 210,000 pounds-force (934 kilonewtons) of thrust and burns for an additional six minutes before cutting off at about 9 minutes after leaving California. During the second stage’s flight uphill, the payload fairing was jettisoned. It was protecting the 10 Iridium NEXT satellites from the friction of the atmosphere in the early part of the flight, but after about 3 minutes, 11 seconds, it was no longer required. After a 43-minute coast phase, the Falcon 9 second stage engine ignited for a second time – this time for a brief 11 seconds – to circularize its polar orbit. Less than an hour after leaving the launch pad (57 minutes and five seconds), the 10 Iridium NEXT satellites began deploying. Each deployment consisted of pairs of satellites being released. The final set was deployed at mission elapsed time of 1 hour, 12 minutes. This was the 46th flight of a Falcon 9 since its first launch in 2010; tonight’s flight also marked the seventh from Vandenberg this year. Iridium-4 was SpaceX’s 51st launch. While some might think this should come as no big deal, given how the first flights of its Falcon 1 rocket ended, the company’s bright future was not a foregone conclusion. Now with more than 50 flights under its belt, the NewSpace firm is preparing for its Falcon Heavy rocket and to confirm “the hell we won’t” launch of its first crew-rated Dragon in 2018. SpaceX has made a habit of proving wrong any predictions about how it would fail to do what it said it would do. Such as the launch rate of the rocket, how it would drive down the cost to send payloads to orbit, and how it would have its first stage conduct a return landing at or near the launch site. To say that the company was mocked for its proclamations would not be an overstatement. Indeed, SpaceX’s Dragon spacecraft was named after the 1963 song “Puff, the Magic Dragon.” The vehicle was named this by SpaceX’s CEO and founder, Elon Musk, in response to comments by critics who had dubbed it impossible. While dragons only exist in myth, SpaceX’s Dragon has spread its solar-panel laden wings on actual flights to the International Space Station some 13 times to date. Tonight’s launch helped to underscore the success that defined SpaceX’s 2017 launch manifest. While the Falcon 9 might not have returned to the launch site, its flight will likely not be forgotten anytime soon. 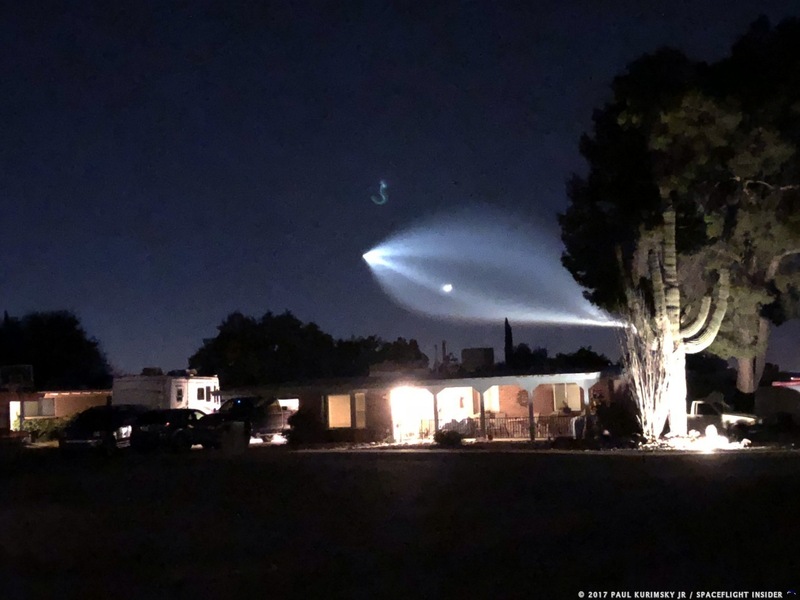 Blazing a stunning trail across the skies that was visible for miles beyond (witnesses saw the rocket’s plume as far away as Tucson, Arizona) the launch site, SpaceX effectively signed off on 2017 across the Golden State’s skies. And another successful mission from the ‘hobby rocket company’. A happy and safe holiday season to everyone. Sad that a certain mob must subtly harass their detractor even when no disparagement of them is present. The message is plain that no criticism of the great one or his company will be tolerated. His cult of hero-worshipers make this known on one of only a few sites where such criticism is allowed. Cheers. I am hopeful that the opening statement made by SpaceX in 2018 will be a successful flight of the long awaited Falcon Heavy! Kudos to SpaceX on their accomplishments in 2017.